The Arnhem-based metalband Mouflon already exists for six years. Since their formation in 2012 they recorded three demos, of which the last one, Mouflon III, is from 2016. However, on October 1st Mouflon released their first physical release, their full-length debut. This debut is titled Devastations and is full of nicely executed, pounding old school death metal. 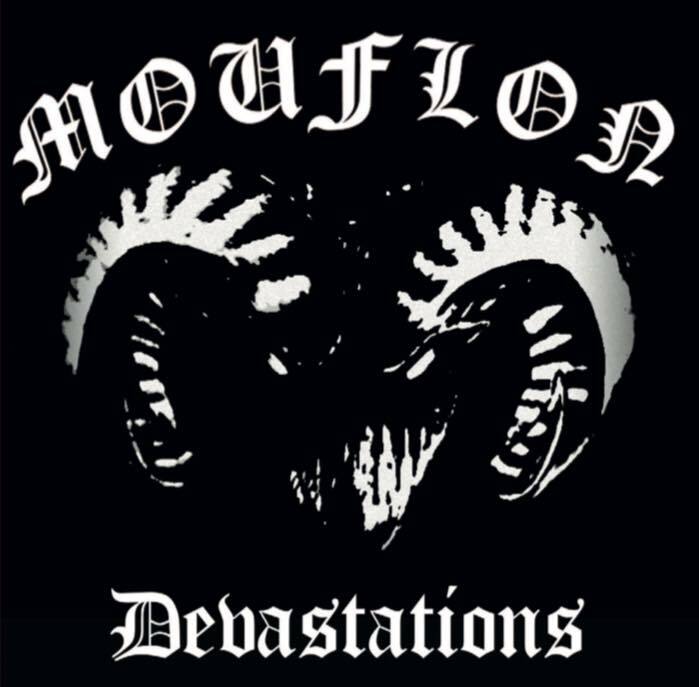 Devastations is the first studio-material on which vocalist RJ and drummer Rutger can be heard as members of Mouflon. Furthermore Mouflon consists of bass guitarist Tijl and guitarists Peter and Richard. On Devastations Mouflon immediately begins full-throttle with Remembered By Skin. Right from the beginning we hear Rutger’s pounding drums coming through the speakers at very high speed. These drums, that have an intense, nice sound, pound very constantly and make, combined with Tijl’s tight bass skills, a very solid basis for Mouflon. However, this doesn’t mean that there’s just very fast blasting on this album. Mouflon’s tempo on Devastations can be very high as well as a bit slower. These tempo-changes, as well as Devastations‘ rhythm-changes, are what makes Devastations very interesting. Two examples of tracks in which these changes can be heard are Alternate Suicide and Violent Mind, while On The Front Lines for example is more straightforward. Violent Mind and the track that follows, The Hunt, are my personal favorites on Devastations. In the last one of these two tracks, The Hunt, Tijl’s tight bass skills can also be heard very clearly. Another example in which this can be heard clearly is the aforementioned opening track Remembered By Skin. In Alternate Suicide a very great guitarsolo can be heard. Another example in which a great guitarsolo can be heard is the track that is named after the band, Mouflon. Besides some nice solo’s guitarists Peter and Richard also deliver very tight riffs on the entire album. Mouflon also is an example of this, another example being Pure Filth. Besides the pounding drums, tight guitar riffs with some great solo’s and the tight bass, Mouflon’s music of course also contains vocals. RJ, who is Mouflon’s vocalist since last year, delivers a very nice and very intense contribution to Devastations. He delivers extremely low grunts which are very constant. In case you might think that it would be boring due to this constancy, you are totally wrong! His grunts are that intense and of that good a quality that they for sure stay interesting. With Devastations Mouflon delivers a very nice no-nonsense old school death metal album which really goes through marrow and bone. This is for sure an album that you can’t miss if you’re a listener of old school death metal!